Chartered Engineer Services in India are available to obtain a CE Certificate prior to the shipment of goods to or from the country. 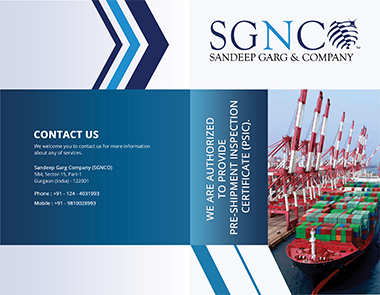 Sandeep Garg and Company (SGNCO) is a DGFT (Directorate General of Foreign Trade) approved agency and a trusted Chartered Engineers provider that can help you obtain a CE Certificate to clear through Indian customs. We have a huge list of registered Chartered Engineers associated with us, who carry out a thorough inspection and issue comprehensive reports in the required format for the Chartered Engineer Certificate as per the mandate of Indian Excise and Customs. Why is Chartered Engineer Certification needed? Chartered Engineer Certification in India is required to export or import old goods and used plants or machinery in the country. For a Chartered Engineer to practice professionally in India, they must be a corporate (organic) member of the Institution of Engineers (India). The CE certification process requires a Chartered Engineer, who holds a qualified degree and has spent at least five years in professional practice, to inspect the goods and provide a certification on the condition of the machinery and plant spares to be shipped. Before shipment, goods are marked on parameters like the balance life of machinery, market value, contents, functional conditions and assessment of goods duty and customs. The testing parameters to determine the condition of the products are generally based on particular national quality standards like BS in the UK and EN in Europe or the internationally accepted ISO and IEC. It is necessary to hold a valid Chartered Engineer Certification to help in customs clearance during import or export of machinery in India. A CE Certificate is also an accreditation of quality and trust. We offer expert Chartered Engineer certification by conducting quality and quantity audits, and cargo inspections for exporters who intend to send their used machinery abroad in the course of commerce, for setting up a plant or shift their operations to a country other than India. We assist exporters with acquiring a Chartered Engineer Certificate in India, prior to shipment, as per the international quality standards adhering to the European laws.Engineer Certificate for Import of goods in India. We also carry out an examination of cargo before shipment from countries like UK, Germany, Australia and the USA. SGNCO has a large global network housing a team of accredited Chartered Engineers or Chartered Engineer Certificate sproviders to importers in India. Availing our Chartered Engineer services for export to India can help importers cut cost and time by avoiding inspection at the time of customs clearances.